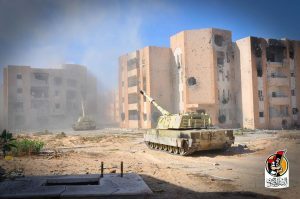 Four more Bunyan Marsous fighters died today and 30 were injured as the advance against IS in Sirte edged forward slowly, at one point behind two tanks. According to the BM Operations Room 20 terrorists were killed in the fighting, which it described as “desperate”. Photos were posted showing at least two bodies, one of whom appeared to be in his middle teens. The battle has focused on the 600 complex of pink flats separated from the BM forces by an area of open ground with little cover. Yesterday five foreign nationals, two Turks, two Indians and a Bangladeshi were freed from a makeshift IS prison. It is not known how they fell into the terrorists’ hands but there has been a number of raids into the oil fields, including Mabruk. In February 2015, five oil workers, three Filipinos and two Nigerians were seized in an IS assault near Mabruk. The latest casualties in BM’s slow push into Sirte’s Third District may have found themselves to be the first wounded to be treated in the Italian field hospital which has just begun work. The fully-equipped and staffed military facility was declared operational yesterday by Italian defence minister Roberta Pinotti. Located at Misrata airport, it is guarded by as many as 200 Italian paratroopers.